I didn’t really have any intentions of posting this recipe. Not because I didn’t want to share it, but this recipe has been around for so long now, that it simply didn’t occur to me to put it on the blog. Until I pulled out the recipe and realized that the original is nothing like the one I use now to make this casserole. It has undergone many changes over time, all of which were stashed in my memory. So I proceeded to write everything down step-by-step and was holding the perfect recipe to share with all of you! This casserole definitely falls into the oldie but goodie category. There are many reasons why this is a family favorite, but the best part is that it requires almost no work the following day. I am all about spending as much time as possible with my loved ones instead of in the kitchen. There is nothing like sitting down for a meal and enjoying every minute of good food, good conversation and perfect company. Sitting down for a meal is really important in our house. Both my husband and I eat supper together pretty much every night at our dinner table. It’s something we have done since day one of our marriage and still look forward to the most each and every day. As soon as this dish comes out of the oven, the entire family will be able to enjoy a delicious meal together. Not only does it make for a nice presentation with perfectly toasted French bread pieces and caramelized blueberries on top, but it tastes even better. 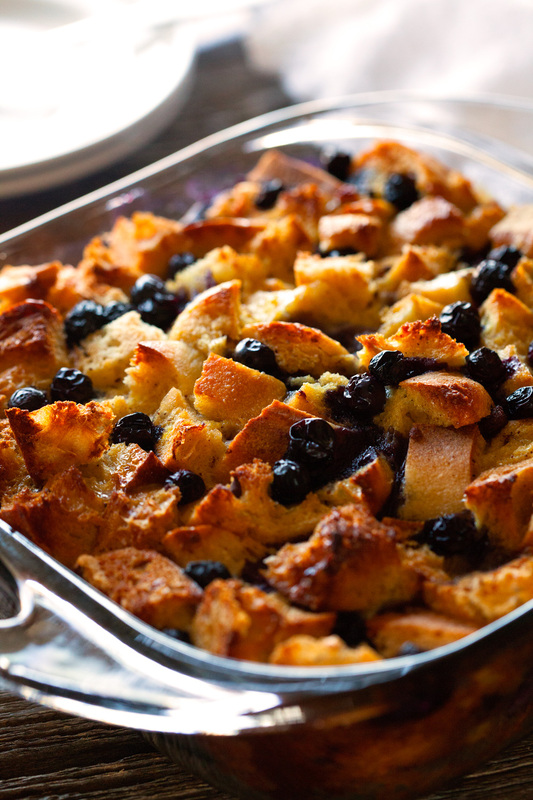 This French toast casserole is crunchy, fruity, sweet and has a soft & creamy middle. It comes out just right every time. I happen to think that this is the quintessential breakfast or brunch food or if you’re anything like me, this is more than appropriate for dinner as well :). 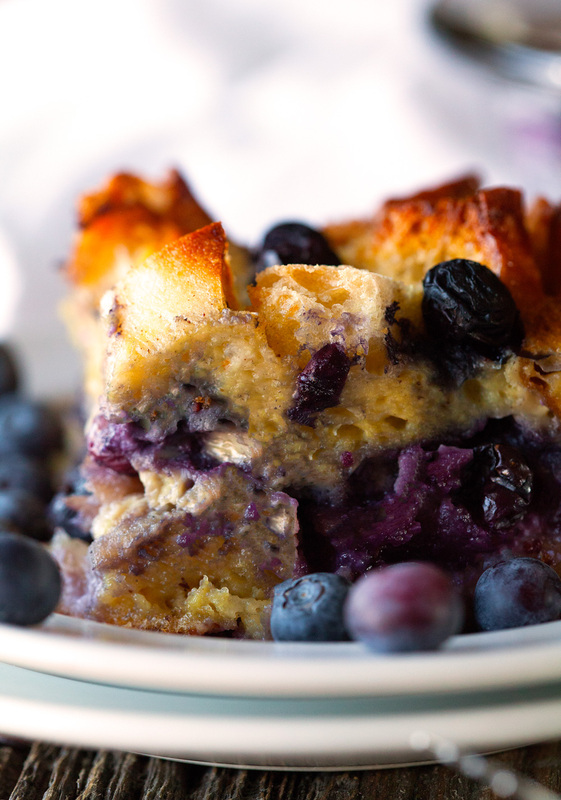 We top our French toast with a fabulous homemade Blueberry Syrup. Making the syrup is completely optional as you could totally serve this with regular syrup or even powdered sugar instead. But if you love blueberries or fruity syrups, this one is for you. And a must-try if you’ve never had it before. Alright, friends. Hope you have a great start to your week!! A super easy recipe for perfectly baked French Toast. This recipe is a family favorite and will be sure to please everyone around your breakfast table. 1. Spray an 8-x-8 inch casserole dish with nonstick spray. 2. Spread half of the French Bread cubes in an even layer over the bottom of the casserole dish. 3. Mix together cream cheese, milk, and powdered sugar until well combined. Mixture should be somewhat thick and not watery. Add more powdered sugar if mixture seems too thin. 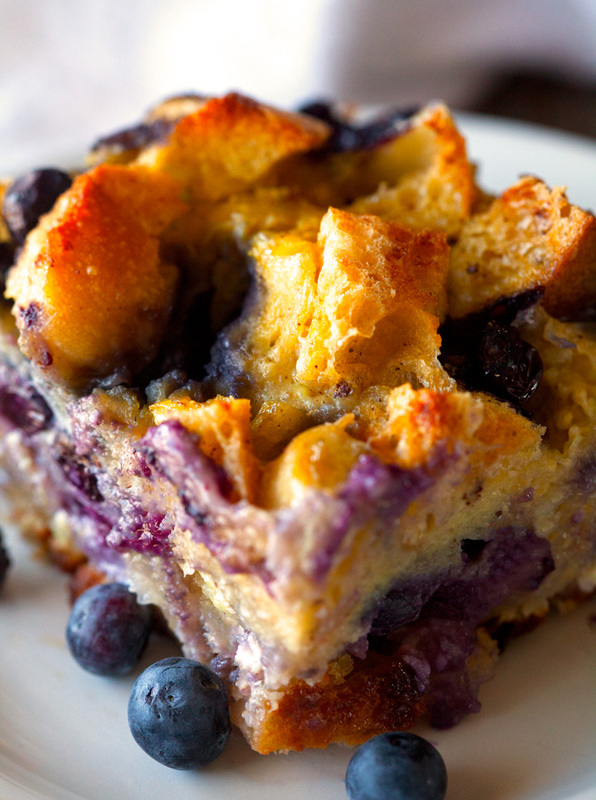 Pour over bread cubes and sprinkle with blueberries. 4. Add remaining bread cubes over the top. 5. Combine 1 cup milk, eggs, vanilla, cinnamon, nutmeg and syrup. 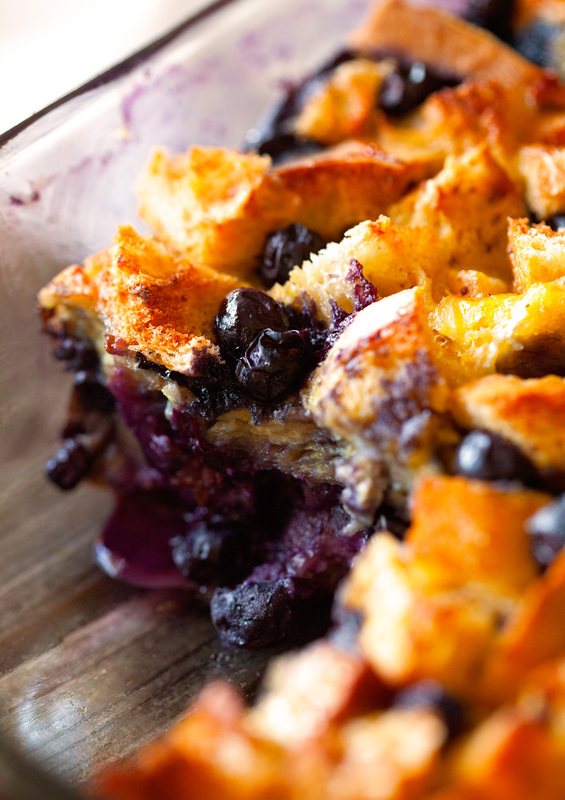 Pour mixture over bread cubes and sprinkle with additional blueberries. Cover with foil and refrigerate overnight. 6. Remove casserole from fridge 30 minutes before baking. Preheat oven to 375 degrees F and bake covered for 45 minutes. Remove foil and bake for another 30 minutes or until the center is set. 7. During the last 10 minutes of baking time, prepare the blueberry syrup. In a small saucepan, combine cold water, corn starch and sugar. Heat mixture and bring to a simmer. Add blueberries and continue simmering for 10 minutes. Serve casserole with warm syrup immediately. Syrup can be made ahead of time and stored in the fridge until needed. Simply reheat in a microwave until warm. Casserole is best enjoyed served immediately, but can be stored in the fridge for 2 days. You can substitute frozen berries. Also, you can use any type of berry you prefer.